Welcome to the brand new week everyone! Today’s post is about staying focused on what is important – your life, your family and your well being. Running a business, especially a wedding business can take a strain on your health, your relationships and even put your future at jeopardy. Don’t allow that to happen. Life is unpredictable and anything can happen. 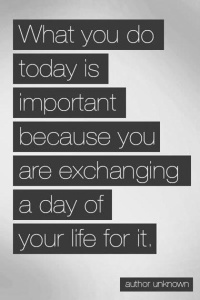 What you do today should count! Stay focused and remember that time flies and your chosen career path is there to sustain you and generate income that will allow you to take care of yourself and your loved ones after you are no longer able to work. Today we are young and healthy, and this is the perfect time to think of your future. Your business should bring you an income that allows you to put money away, invest into retirement annuity and contribute to a pension fund, you should be able to set up trust funds for your children and look for investment opportunities to grow your business and better your life and the life of your employees. Don’t be that proverbial butterfly fluttering around being all fabulous planning weddings because you love it so much whilst the ants prepare for the winter. Yes we are in the beautiful business, yes it is easy to loose sight of things, and it is incredibly easy to loose money and time is something we can never get back. Last week, an annonomous person posted on my blog accusing me being a ‘money grabbing wedding planner’. I find it bizarre that a business would be accused of it, since that is the point of the business – to grab money. I work hard and I charge for the services I provide, and that allows me to grow my business and prepare for the preverbial winter, because yes winter is coming. I encourage every wedding planner to think of their futures. Are you able to support your lifestyle on your current income AND save, insure and provide for your future financial well being? If the answer is ‘No” then you should take a hard look at your business and figure out how you can change it. My next workshop is in Cape Town on 27 and 28 October and if you are interested in learning how to generate an income with your wedding planning business you can register here.